Clothing/Jewelry Description A black and yellow top with a tiger stripe pattern, and black shoes, and carrying a red bag. Distinguishing Characteristics Native American female. Black hair, brown eyes. Some agencies give Sharon's last name as "Bald Eagle." Her ears are pierced. Sharon ran away from her hometown of Eagle Butte, South Dakota on September 18, 1984, along with an older female friend. According to her companion, they were hitchhiking together in Casper, Wyoming when they were picked up by Royal Russell Long. A photo of him is posted with this case summary. Long took the two girls to his home in Evansville, Wyoming, fed them, then offered them $100 for sexual services. When the girls refused, he tied them up at gunpoint, beat Sharon and raped her friend. The older girl escaped and went for help, but by the time police arrived at the residence, Long and Sharon were gone. Long was apprehended in 1985 in Albuquerque, New Mexico. Sharon wasn't with him and he said he did not know her whereabouts. He said he drove her to Cheyenne, Wyoming and put her on a bus or truck bound for Dallas, Texas and this was the last time he ever saw her. Prosecutors considered charging Long with Sharon's murder, but they decided against it, and Sharon's father stated he believed his daughter was alive. Long pleaded guilty to two counts of kidnapping for the purpose of committing indecent liberties with a minor and was sentenced to two life terms in prison. Long, a truck driver, is also a possible suspect in the disappearances of Deborah Meyer and Carlene Brown, who vanished from Wyoming in 1974, and he is the prime suspect in the disappearances of Cinda Pallett and Charlotte Kinsey, who vanished from the Oklahoma State Fairgrounds in Oklahoma City, Oklahoma on September 26, 1981. He was charged with kidnapping and murdering Cinda and Charlotte after his 1985 arrest, but the charges were dismissed for lack of evidence. He died of a heart attack in prison in 1993. Sharon's father went to visit him shortly before his death, but Long refused to speak to him. Sharon is the oldest of four siblings and disappeared right before she was going to begin her first year at Brainerd Indian School in Hot Springs, South Dakota. Her father is still alive and searched for her all over the country after her disappearance, traveling as far as Arizona. 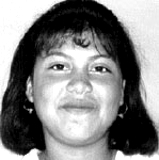 There were possible sightings of her in Wisconsin and Colorado in the years following her disappearance. She has never been found and foul play is suspected in her case. Updated 9 times since October 12, 2004. Last updated February 17, 2018; two pictures added.